Production Time & Shipping Options may be viewed in each products calculator. Production time varies by product and typically ranges between Next Business Day to 10 Business days depending on the product and quantity you are ordering. Once your order and proof approval have been received, production time is the number of business days it will take to process your order through our production department (not including any holidays during which our business would be closed.) Rush processing may be available - For example: 4 day Rush Processing – if you approve your proof on Monday's business day, your order would ship Friday. Note, because our business days are Mon-Fri, the same 4-day Rush Processing for a proof approved on Wed would result in the order being shipped on the following Tuesday. Production time does not include transit (shipping) time. If you are ordering postcards that are being delivered through the USPS directly to people's homes, you will determine the in-home dates by adding Production Time to Transit Time & then the following 1-3 business days will be your anticipated in-home dates. Transit time varies depending on your location. Your options for shipping can range between Next Business Day AM delivery to Ground which can be up to 5 Business Days for delivery. 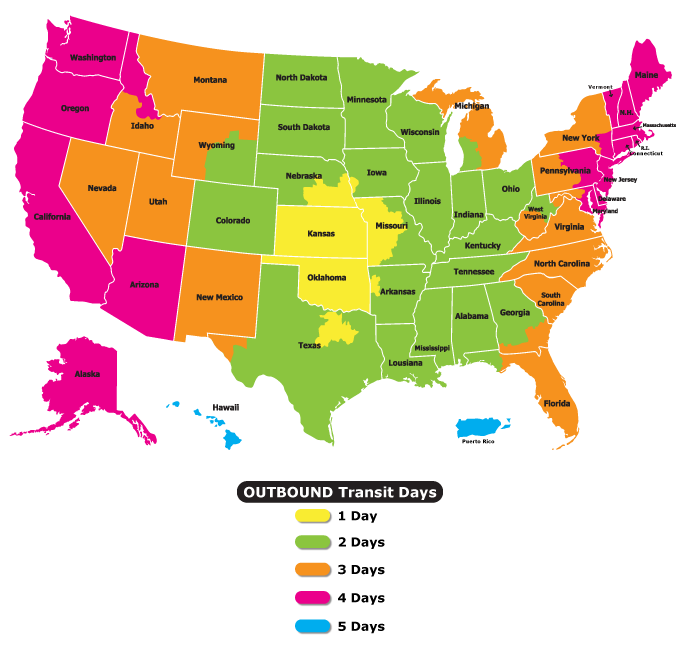 Transit time is the number of business days it will take UPS to deliver your order. See the map below for regular outbound Ground UPS Service from our facility in Wichita, KS. Need your order sooner? UPS offers Next Day Air and 2 Day Air Service options which are shown in the calculator or you may request these options be included with your estimate if you are ordering directly through Customer Service. Per ups.com Saturday delivery is available to only certain locations. Please call us to check availability. Saturday delivery is not available through the online calculator. You will have to call us for pricing and availability. If we do confirm that this method is available to your location, additional costs for this will have to be paid offline through our customer service rep.
Commercial Destinations: Next business day delivery by approximately 3:00 or 4:30 p.m.
BE CERTAIN the shipping address you list in your checkout process is correct. . If it is not correct, you will be charged additional costs if the order is returned to us or we have to reship it back out to you. This amount has to be paid in full before the order is reshipped to the corrected address. Customer service will contact you if a shipment as been received back at our facility and let you know the amount due to reship the order and verify the address you wish to reroute your package. Please remember if you select Hire A Designer during the order process, the times below will reflect your actual proof approval date as opposed to your order date since additional time is required to create your design and receive your approval to the proof.